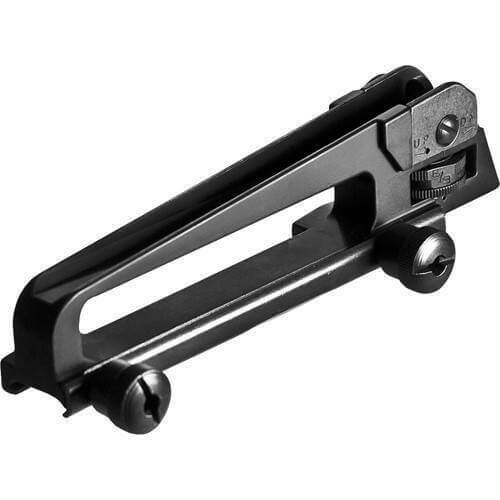 AR15 Standard Carry Handle, This two-in-one detachable carry handle for AR type rifles. Fits on flat top guns and acts both as a carry handle and a rear sight system. Integrated adjustable rear sight with windage and elevation clicks. Two strong locking thumb nuts keep handle in place. Thanks for sharing your feedback, Eric. We're glad you're satisfied with your purchase. Cheers! Good carry handle for the price,best one I’ve found even close to this price range. Very fast shipping,arrived a day before it was supposed to! Another quality product from At3 tactical! I continue to be impressed with At3’s products, and even more impressed with the fast, excellent service they provide. Great guys !! The carry handle is for my new A4 model ar15. I am a new user of the AR platform, knowing that, I am very pleased with A3Tac. Company and their support . I think the carry handle I purchased is a good buy and I would recommend a buy from A3 Tactical Company to any one who is interested in outfitting their AR platform. Their products are priced reasonable and the merchandise is good quality. Fits my S&W m&p 15 sport 2 perfectly. I like the classic look of m4/m16 rifle with carrying handle and this handle does that nicely. the sight is almost spot on out of the box. All it needed was some minor adjustments and I was able to hit 10” steel at 100m all day long. Over all this is a greatly built carrying handle and I recommend anyone who considers getting a carry handle to give this one a go.